We had a little bump in the ride last week. Xero didn’t seem to have sub-accounts. But a sub-account by any other name smells as sweet. I have to confess that I’m a bit of a nervous flyer. 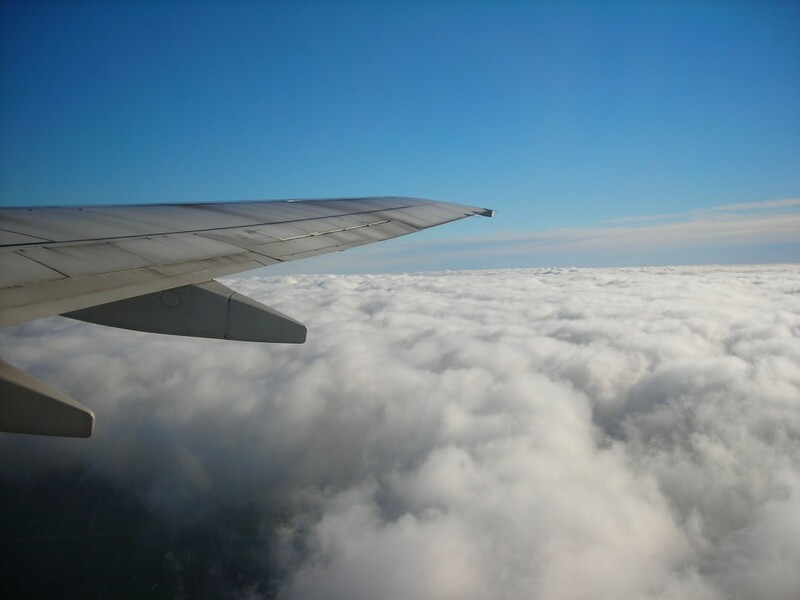 I’m not someone who refuses to fly – ironically I love to travel – and I don’t get all panicky or anything. I just never feel quite at peace. Maybe I’ve watched too many episodes of Air Crash Investigations. I had a similar nudge last week during a Xero webinar. We were all gathered in the conference room watching ‘Xero Essentials’ when the presenter began reviewing the Chart of Accounts function in Xero. As she was doing so, almost as an aside she said something along the lines of “..and of course because Xero doesn’t have sub-accounts…”. Cue dramatic music! A quick glance around the room revealed colour rapidly draining from faces. We weren’t sure, but that didn’t seem like something to simply be glanced over. Kinda like a pilot casually throwing in “…and of course because this plane no longer has any fuel…” A little further explanation might be required! 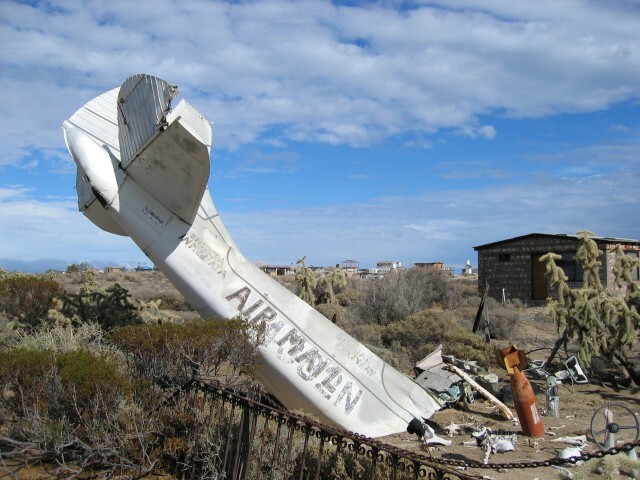 I admit it…I didn’t think to ask whether or not the plane had wings. It’s not something we thought to ask about as a part of our decision making process. We put it in that group of things that were too obvious to even question. We didn’t ask whether it was double-entry based either, nor if it could handle GST. It’s nudges like that on this journey that strike at your soul and leave you asking “are we meant to be doing this?” All these people are counting on us. We’re meant be making their lives easier by giving them systems that help them rather than creating more work. What are we doing here? I rushed out of that webinar and immediately called Tim at FGS. This may be getting old, but it’s another example of why we need them on this journey with us. They’re like our Sherpa. There are times when the terrain might seem hostile and a little frightening, but they know the territory and when you see it the way they do, you can relax a little and enjoy it. Tim called me back within the hour. “I have a solution for you!” To be honest, I was reasonably confident he would because they work with accountants. We’re pretty sure sub-accounts form part of the basic building blocks of life for accountants. Perhaps this is already out there. But a search through the Xero help resources yielded no results, and a Google search for ‘Xero sub-accounts’ (and variations thereof) was likewise inconclusive. A note to Xero: even though you don’t use the term, it might be worth putting an entry called ‘sub-accounts’ in the help section. People (accountants) will be looking for it. Maybe some Xero veterans will look at this and think ‘I can’t believe they’re posting about this!’ Hopefully one day we’ll think the same thing too. But this is the view of the journey as it’s happening, not a retrospective slideshow where we’ve had the time to collate the best shots. So if you don’t mind indulging me a little, here’s the solution. Use grouping. It’s still not technically sub-accounts, but for the purposes of our reports, it achieves the same thing. Let’s say you want to sub-account your Motor Vehicle Expenses. The standard code in the Xero demo company is 449, if you use them. So click Settings then Chart of Accounts. 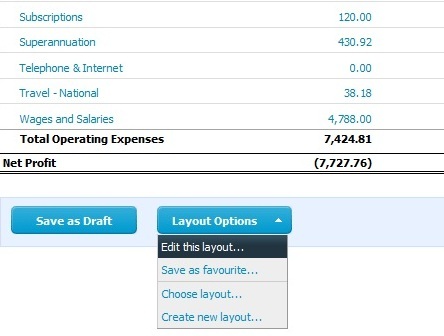 Create new expense accounts in the same range. Hopefully the process of creating an account is self-explanatory. So in this example, create say 449.01 MV Insurance, 449.02 MV Petrol and so on. Note that account names must be unique, so you probably can’t just have ‘Insurance’ as this will likely exist elsewhere for general insurance items. Once the accounts have been created, select or create a report where you want to show a summary of those accounts. For example, at the moment, these accounts will all show separately in your detailed Profit and Loss Report. Tick the accounts that you want to ‘group’ together. 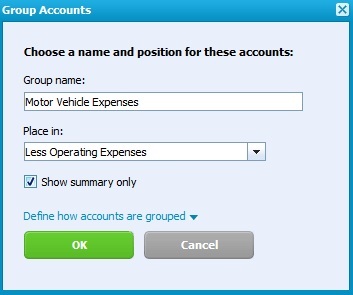 So in our example, tick all of the Motor Vehicle Expense accounts, including the main ‘header’ account. 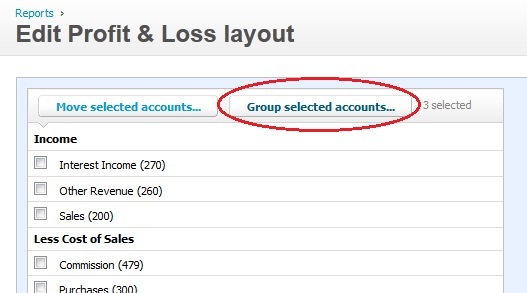 Back up at the top of the layout editing screen, click Group Selected Accounts. A popup appears. 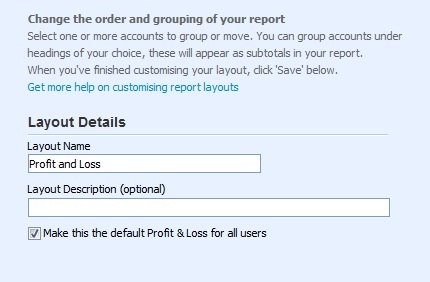 The Group Name should be the main account title (or whatever title you want to display on the report). In our example, this is Motor Vehicle Expenses. Select where in your report the group should appear. In this case it is an operating expense. Also, make sure to tick Show summary only. You can also get it to add future accounts to the group automatically by clicking Define how accounts are grouped and specifying the criteria. Once you’ve clicked ok, you’re almost done. You then just need to save these adjustments to the layout. On the right hand side of the layout window, either keep the same name or if you want to save a new report, rename it. If you’re basically making this a report that will become the standard, you can also tick Make this the default Profit & Loss for all users. Then click Save at the bottom, and you basically have sub-accounts that show as a summary in your main reports. Naturally, you can also create other reports that will show you the details of the sub-accounts if you need to. The thing about the fear of flying is that it’s mostly in your head. Statistically airline travel is probably the safest way there is to get around. It’s just being in an unfamiliar place that makes you lose perspective when you hit those little bumps. Chances are you’re going to be fine. Better than fine even. This entry was posted in Uncategorized and tagged accounting practice, sub-accounts, subaccounts, xero by johnatdewings. Bookmark the permalink. Thank you!! You appear to be the only ones providing this information. I too use “sub-accounts” and need to be able to breakdown for example motor vehicle costs, this has definitely helped. Thanks Alison. It was more about time than anything else. Plus I felt like we ran out of interesting things to say. We’re still on the journey to some extent but things just became more routine and normal. I still keep it live though in case there’s anything here that might help others.